A TAKI evening is therefore not an ordinary concert but a ceremonial setting, starting with a sharing round to feel what's going on in our personal lives, to connect with the stories that enter the room. Now, instead of drinking plant medicine, we drink WATER. The water travels through your cells and is guided in the following hours by the ICAROs and sounds of our music. Songs from air and water. 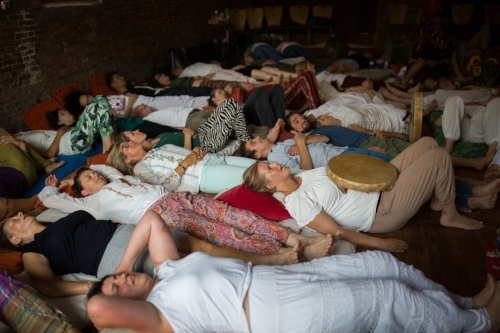 Here we will use the TAKI concert with a rebirthing session through transforming breathing. After this deep breathing session of 1 hour the body is in a very deep relaxed state and the mind is also very receptive to the icaros and sounds. You can attain a TAKI ceremony, organised by us, or you can host one yourself by inviting us to your centre or living room.